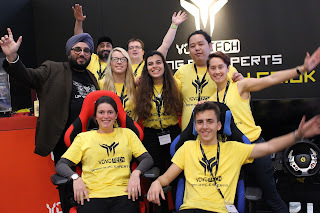 Leading retailer of high-end computer components and customised gaming PCs, YoYoTech, takes part in one of its most successful events to date. The Westfield Shopping Centre in London hosted its Technology Showcase event from 26th - 30th October, with YoYoTech situated on its list of exhibitors. The Tech Show was accommodated with the aim of presenting tot he public the latest technology and innovations brought by prominent IT and gaming companies. YoYoTech showcased its latest gaming PCs, various peripherals and monitors from a number of vendors, customised systems with a higher SP designed specifically for the event, and of course the Oculus Rift, which proved to be the event's main attraction. Also present at the YoYoTech stand were representatives from both the MSI Notebook and ASUS teams, who were each offered their own section at the exhibit in order to push their products to YoYoTech customers. This allowed customers to interact directly with some of the top vendors represented by YoYoTech. In addition to its being a successful event in terms of great sales, the Technology Showcase was also pivotal in allowing face-to-face contact with existing and potential YoYoTech customers, as well as generating further buzz around the brand name. "We really showed our customers our Value add, when brought face-to-face with them." "A truly amazing event, with a good chance to meet old and new customers, and a great response all around. Most importantly, however, it was great team work and I extend my gratitude to the Centerprise HR and Marketing teams for their help making the event a success. We look forward to attending many more events in the near future – YoYoTech rocks!"